Back in the 1960’s, it was the United States vs. Russia for the race to the moon. These days, it’s not world superpowers battling it out in space but instead, three billionaires. SpaceX, Virgin Galactic, and Blue Origin all want to be the premier name in space travel but who will win? Let’s see how they stack up. Elon Musk is no stranger to space. Over the years, he’s used SpaceX to deliver satellites and resupply mission to the ISS. The company also revolutionized the reusable rocket industry, if you can say there ever was one. Today, SpaceX is looking to surpass Virgin Galactic and Blue Origin by flying two space tourists to the moon in 2018. It will be the first time the company launched a mission with any humans on board. Furthermore, Musk wants to go to Mars with hopes of colonizing it. Much like SpaceX, Jeff Bezos and Blue Origin want to use reusable rockets to lower the cost of space travel. However, that will have to come at a later date. For the moment, Bezos wants to bring tourists on suborbital flights around the Earth. 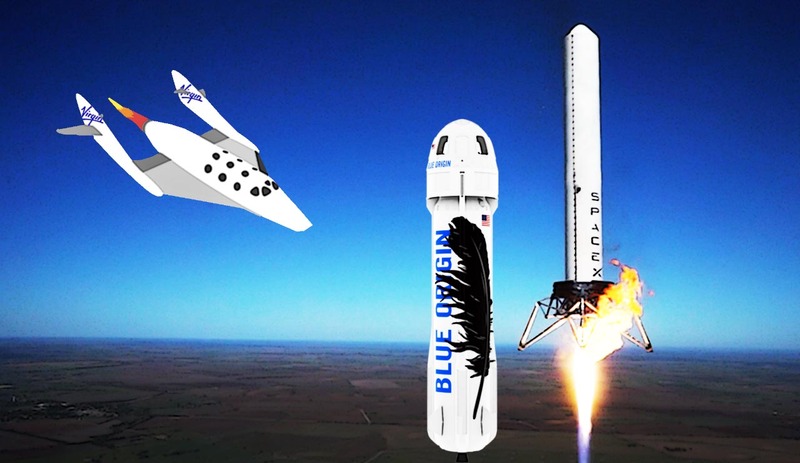 Big wins for the company revolve around their famed rocket, New Shepard. New Shepard launched successfully over five times. However, these were all just suborbital launches and never went anywhere far. Eventually, Bezos will launch a new rocket called New Glenn. New Glenn will take on difficult missions like carrying satellites and other equipment into the orbit. Now, let’s see what Virgin Galactic can do. Like Jeff Bezos, Richard Branson wants to take tourists to space. But instead of using rockets, Branson wants to fly in a reusable space plane. Picture it as an airplane but a whole lot faster. This plane flies 10 miles about Earth where it then releases a spaceship with passengers inside. These passengers will then travel 60 miles from Earth before returning safely home. Today, Branson is selling tickets at $250,000 a piece. Justin Bieber already signed up. So, are you ready to join him?